Here’s a picture of what our family room has looked like for the past 18 years, ever since Diane and I purchased this house new. Some of you may recall a year or so ago we completely remodeled the kitchen which had that huge, double tiered, radiused cornered light structure as its main feature. Well, this room has always been somewhat of a problem for furniture arrangement and the moving men are Diane’s friends for sure! You can see that over the years we’ve added a shelf for stereo and the TV sat below but it can only accommodate about a 30″ flat screen and you know the trend with televisions. Then there’s the fireplace. Many years ago the old pink tiles were removed and I updated it with the mosaics you see here but, here’s the thing! We figure we’ve used this thing twice in 18 years. It’s not placed well, it costs an enormous amount of $$ for the gas to run it, and then it hardly puts out any heat at all. For the most part I believe more heat escaped through the flue than we ever gained. Our first thought was to remove the radiused corners and niches, flatten the wall, and try to make the fireplace a more attractive item. Have you heard the expression “Putting lipstick on a Pig”? That’s how we felt so, in the end; we decided to board it over completely, why try to enhance something you don’t use? I began work on this project last Monday. Started by ripping off the drywall along with the radiused corners on the left side of the room thinking that would be the easiest place to see what I would be up against. At days end, all of the drywall and the radiused corners had been removed. The truck was loaded and ready for a trip to the transfer station in Henderson the next afternoon. 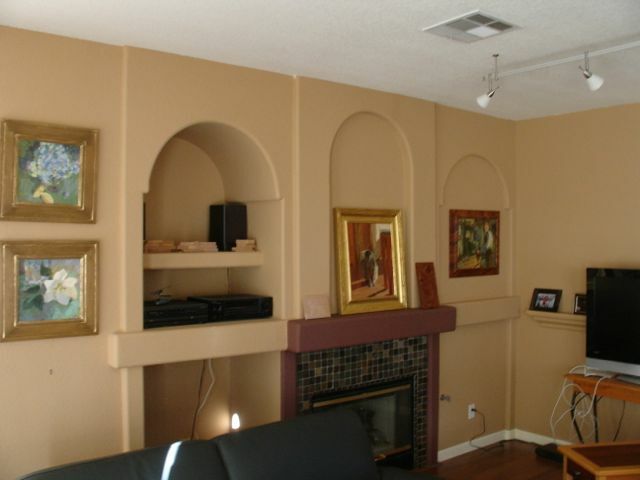 As you can see, the center part above the fireplace is still there. 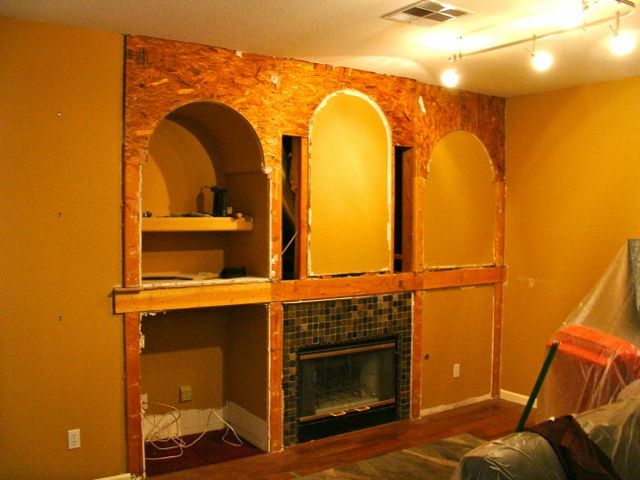 My thought was that since it was recessed anyway I could simply add some nailers and then drywall over the entire wall. The more I looked at that the less I thought of that idea. Most of all, there wasn’t enough supporting members to suit me and the wood was all in pretty bad shape. 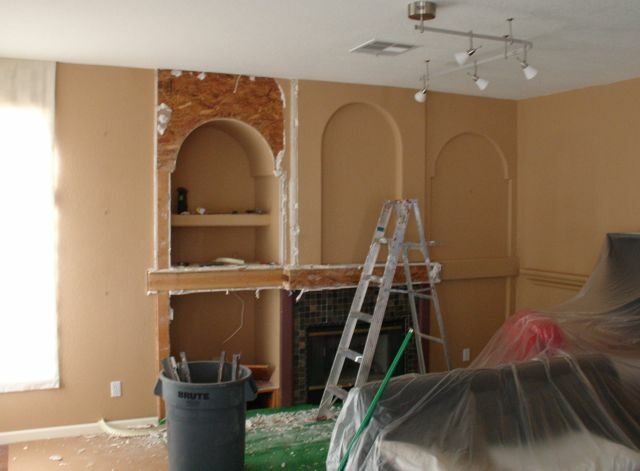 Looks like whoever framed it in went nuts with their hammer — yikes, what a mess! Combustibles right next to the Firebox! Miller time — on the job? Well, it’s just about days end and all of those empty beer cases tells me it must be close to Wine Time, more tomorrow. This entry was posted in Home Remodel and tagged 90's radiused corners, fireplace, home construction, media niches, outdated, remodel. Bookmark the permalink. 1 Response to Twice in 18 Years = Get Rid of It!! I hope you had the cat around for supervision! It’s amazing how builders will allow these things to occur. Obviously, no building inspector saw the lack of insulation.